This year’s Tasting Australia will introduce a national spirit awards event to recognise the success of the burgeoning distilling industry and offer South Australians a chance to taste top products from around the country. The Tasting Australia Spirit Awards are part of a program of more than 140 TA events across 10 days (April 13-22) launched today, and will include categories for gin, whisky, vodka, rum, brandy and liqueurs. TA ambassador Nick Stock will lead the expert judging panel and says the awards will be presented amid a large public tasting event in the Town Square festival hub in Victoria Square. “It’s recognising the fact that instead of buying bottles of imported spirits and stocking famous brands that come from other countries and other hemispheres, our Australian spirits industry is now really vibrant – it’s exploded. As well as giving festival-goers a taste of the wide range of spirits being produced around Australia, Stock says the awards will further understanding of what makes a quality spirit. Following the awards event, distillers will also be participating in “bar takeovers”, where they will present signature offerings, speak to customers and pour drinks at various bars around the city. “That’s about trying to share their presence and their wares as widely as we can,” Stock says. The Tasting Australia Spirit Awards judging panel will comprise distillers, retailers, bar owners and other experts, including the man known as the Godfather of Australian whisky, Bill Lark of Lark’s Distillery in Tasmania, Graham Wright of specialist online whisky retailer The Odd Whisky Coy, and SA small-bar owners Marcus Motteram (Hains & Co) and Ollie Margan (Maybe Mae). Stock says the panel will be looking for both the technical attributes of a well-distilled spirit, as well as the “interpretation of style” that produces a delicious drink. 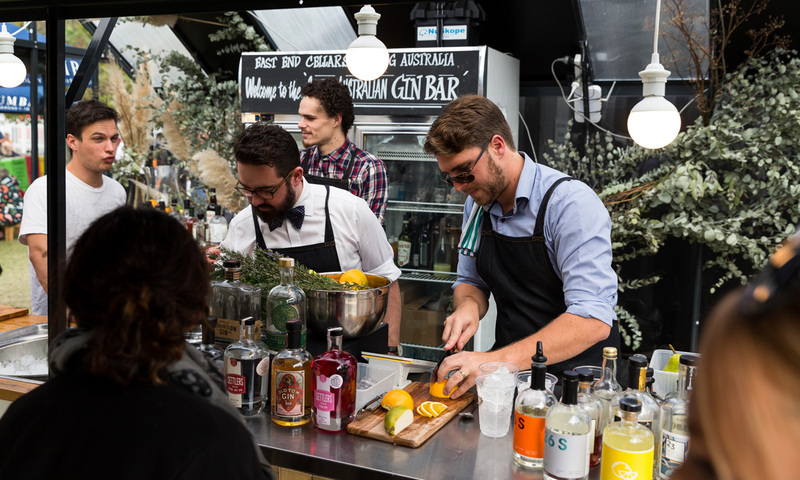 A gin bar in the Town Square at last year’s Tasting Australia. Stock says the boom in craft distilling comes off the back of a global drinks trend towards rediscovering the world of the cocktail and the cocktail bar. Another new Tasting Australia experience this year will be “Tasting Australia Airlines” – a full-day luxury experience to SA culinary regions such as Kangaroo Island, Coffin Bay and the Limestone Coast. The festival will open with a Surrealist Ball at the new d’Arenberg’s Cube in McLaren Vale, and close with the sold-out Fresh Wine Disco at The Manor at Basket Range. Guest chefs will include Rodolfo Guzman of Boragó in Chile, Christian Puglisi of Relæ in Copenhagen, Mehmet Gürs of Mikla in Turkey, Carlo Mirarchi of Blanca in New York, and Christian and Manuel Costardi of Ristorante Christian e Manuel in Italy. Simon Bryant returns as festival director, with Restaurant Orana owner and chef Jock Zonfrillo as programming director and Cheong Liew as patron. The 2018 Tasting Australia will run from April 13-22. Entries open today for the Tasting Australia Spirit Awards, while tickets for the public tasting and awards ceremony will go on sale in March.